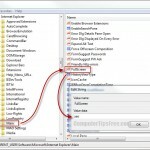 This post explains how to retrieve missing or disappeared toolbars in Internet Explorer 11/10/9 on a Windows 8/7 computer. 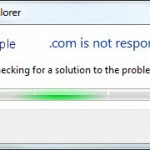 There could be a number of reasons the Internet Explorer toolbars such as the favorites toolbar suddenly gone missing (usually after upgrading your IE 11/10/9 or re-installing it). When you upgrade your Internet Explorer from an older version to the latest one manually, if you have toolbars such as Google Toolbar, Alexa toolbar or even your favorites bar, they can all be missing/disappeared because every time you do a re-installation of IE, it will most likely revert all your IE settings to default. If that’s the case, you will have to re-enable it (provided if the upgrade or re-installation didn’t wipe out your toolbars). To enable toolbars in IE 11/10/9, simply right click anywhere in the empty area beside tabs or the address bar, then select the toolbars that you want them to appear in your IE11/IE10/IE9. 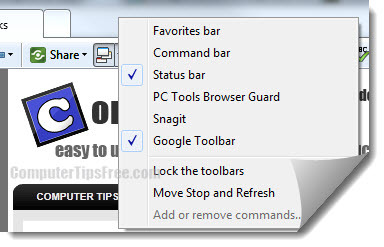 If your toolbar doesn’t show up from the list of toolbar via the method above, you or the system has probably somehow uninstalled it either intentionally or unintentionally. In this case, you will just have to download and install the toolbar again. This can happen if your anti-virus program mistakenly recognize your toolbar as a kind of threats to your computer and removed it for your sake. If a toolbar suspiciously went missing, it could be an adware, a spyware or a virus that is able to bypass your authority and inject or alter the setting of your browser (Internet Explorer). Hence, hiding your toolbar without your acknowledgement. 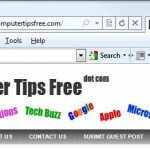 These adware and viruses often come from the malicious toolbars or software you’ve installed. It can be dangerous if you often access websites such as your online banking page. In that’s the case, you should have a reliable antivirus software installed and running all the time to protect your PC (we recommend avast free antivirus). Use it to scan and eliminate the threats immediately if there’s anything suspicious happens such as the IE toolbar missing case. If your antivirus detects threats from within the toolbar you have previously installed, you are advised not to install that particular toolbar ever again. Did you ever scan your computer for registry errors? Registry is a place in the Windows system that stores every piece of information about settings and configurations of all software in your Windows PC. It also stores all settings about Internet Explorer. Registry could turn messy as you use your computer over a long period of time and would cause errors. 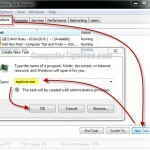 Scanning for registry errors is a must-do clean up works for your computer maintenance. It should be scanned gradually to ensure stability and usability of your system. To scan your computer for registry errors, we recommend Registry Easy.